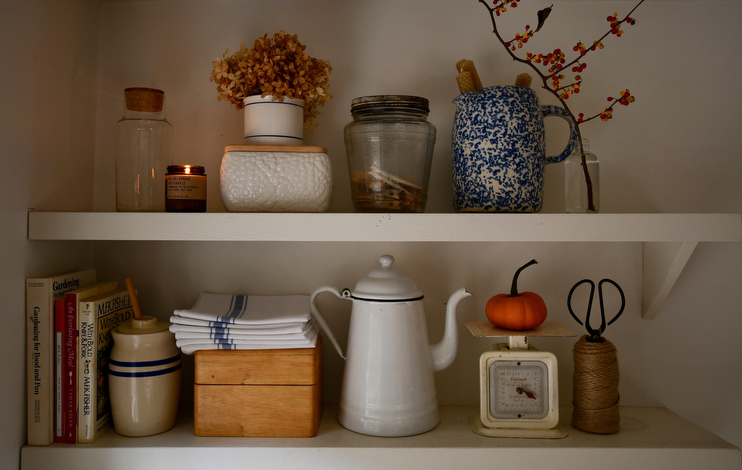 Every season I shuffle things around on these here shelves in the corner of our kitchen and it always brings me joy. This autumn, I have a mix of objects new and old that together tell such a sweet story. The thrifted items are: the ivory scale, the honey crock with two blue stripes, the speckled stoneware jar, the clear glass water bottle with cork top, tiny clear glass bottle, a few books on cookery and gardening, and the base of a butter keeper. I can’t manage to part with any, so here they’ll stay through the season. The items from grandma are: the old glass jar for clothespins, the white enamel kettle, the wood recipe box, and the hidden recipes within. From nature, well you can see that plain as day, and the new: a candle that smells like autumn should, crisp new napkins for Thanksgiving, and twine, because that always comes in handy. 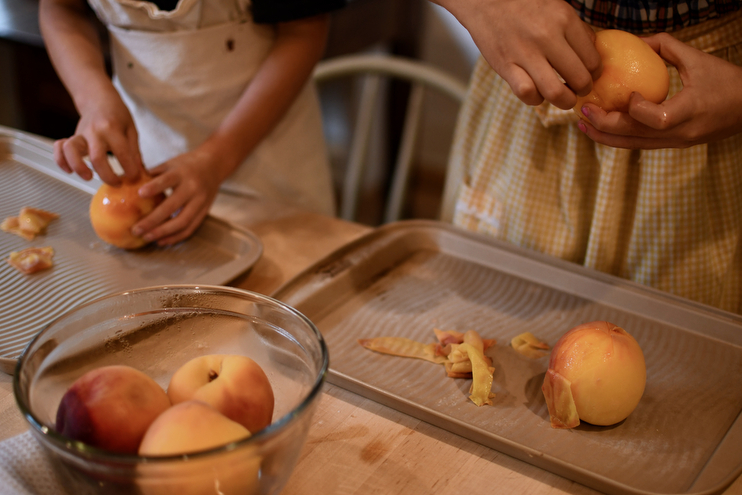 We spent a Sunday afternoon on the last stretch of summer boiling and peeling peaches for a crisp! I learned in Paris during my cooking lessons that if you make an X with a sharp knife in the skin of the peach at the base and plop it in boiling water for about 30 seconds, the skin peels right off and makes for the perfect peach cobbler filling. Home on an slow Sunday. Remnants of Halloween costumes laying around, a lantern lit, and piles of clothes both ready to be washed and ready to be folded in the dining room. I love it here. Sous chef Theodore tasting his crisp makes my heart sing. He is so tender and delicate in all that he does – his movements like a soulful birdsong. I love watching him do everyday things because he does them with such care and attention. It’s really inspiring, and sometimes frustrating when the rest of us are rushing out the door, but he is teaching me with all his ways the art of slowing down even more than my already fairly slow tempo. What a gift he is. More things from grandma’s and grandpa’s house: antique canning jars. They had about a hundred, and I took this lot right here. I don’t know why this image stuck me so, but opening up the washing machine with the steam bellowing out, warm on my face, made me smile. She used to fill these with food from their farm, and that thought gives me so much comfort and inspiration. I especially love the thick blue ones, and plan to use them for dry good storage in our pantry. 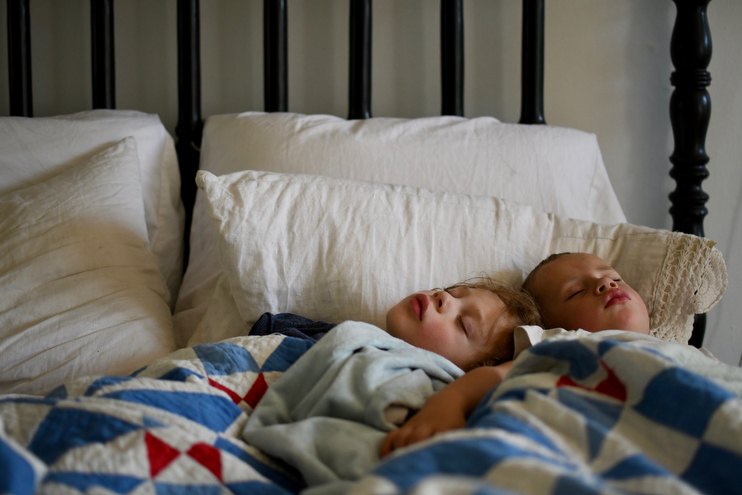 How wonderful are playdates? They are just as much for the mamas as they are for the babes, and this one was short but oh so sweet. The kids were growing restless so I pulled down a few ears of dried corn cobs and they spent a good chuck of time picking off each individual kernel before placing them in a jar. Couldn’t get a still image of Alfie, which is so entirely Alfie, and this is Juniper, with the tiniest little dimple! Apparently grandma had a recipe for cricket spray, and not only did she have a recipe for cricket spray, but it was for cricket spray “5” that included turpentine. Yikes, grandma. Wonder what the “5” means? Stella with her robe, Alfie with his hand, and Theo in his jersey. Things I want to remember. …and dino on the table, flowers picked by little fingers, and a candle rolled with little hands. These are the days. I’ve had quite good luck thrifting this season, and that walnut Shaker side table is one of my finds. It was marked for $13 which surprised the heck out of me because besides a tiny knick in the wood, it’s in grand condition. A happy addition to our living room, I think! Taken on the first day of school, Stella helping Theodore crack a smile as helpful big sisters do. Those cowgirl boots are magic. Every now and again I’ll pull out a book of seasonal songs and poems and read them or sing them to the kids. It’s a fun way to incorporate beautiful language and music into our day at home. This is Alfie in his element, having fashioned a sheath for his sword he borrowed from the neighbors with Angus’ dog leash. Notice the whistle and bare feet. Oh, I love him I love him. I don’t understand how or where he gets these ideas, but I love him. What’s an autumn at home post without an entry photo? We’ve brought out all the knits, baskets, and gourds galore! Also, four of these items in this photo are thrifted, can you take a guess which ones? Stella cleaned out all the lemon balm that overtook the weedier part of our sad little herb garden a few weeks back so I could take a stab at making a my first ever homemade tincture. It’s nearly ready, and when it is, I am going to share the recipe and wellness benefits here with you. Any tincture takers? My kids don’t make forts, they make fortresses. I’ve been told there’s a difference. And this is almost always how our living room looks at least one point in any given day. They have more fun building and making them then they do playing in them, which reminds me of myself and how much I enjoy rearranging things in our home. If you’ve found yourself with one or two too many apples, cut it in half so the star inside is exposed, paint it, and stamp it. We did this for about forty minutes a few weeks back and made really pretty prints to hang around the house. In other words, play with your food. Alfie is 3 and a 1/2 and naps are fading over here. He takes about two a week, and when he does, it’s much needed. I am talking three hour mouth open drool everywhere sleeps. I need me one of those. Andrew turned 32 in September and we gifted him some new sweaters and jammies. There’s something so nostalgic in wrapping gifts wit plain brown paper and simple jute string. I do it for every occasion, and it always looks quite charming. I bought a dehydrator from Aldi recently and have been making cinnamon sugar apple chips nonstop since they have been in season. The kids eat them so fast, I cannot keep up! These are also wonderful in tea, and crumbled up in yogurt. Along with the lemon balm tincture, I have been channeling my inner witch by making other potions with natural materials lately, one being fire cider tonic. I was going to share it Wednesday, but the universe had other plans. So next Wednesday it is! And you know what, it’s not too fiery! I take mine with honey and it cuts the heat. Andrew smokes food now, mainly meats and the occasional squash, as he did last Sunday. He cracks me up. One day he decided on this new hobby, went to the store and brought home a smoker, and a heck of a lot of wings and ribs. They were all amazing. He is way more technical in his cooking fashions, and it was a joy to watch him work and tinker around with flavors. 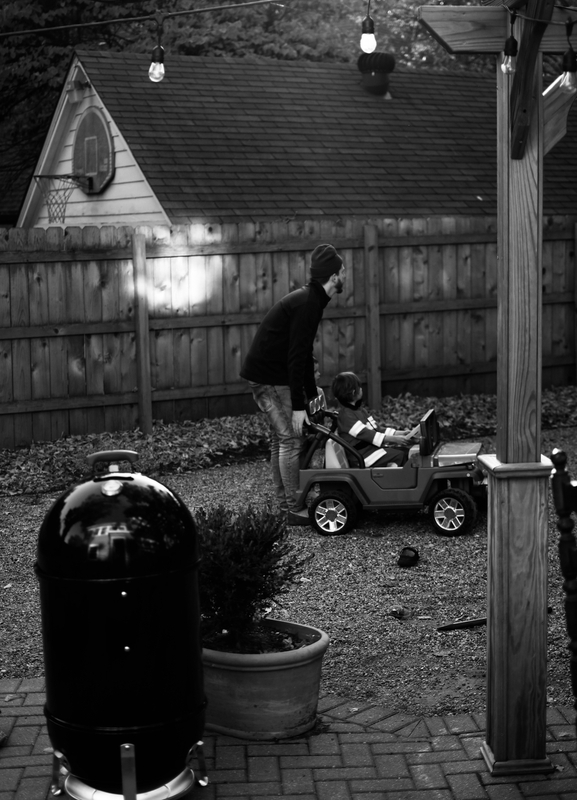 Thats him on Sunday, which he has dubbed “Slow Cook Sundays” like the sweetie pie he is, giving Theodore a push in his car. That’s our smoker, yet to named, which we do to things around here for some strange yet satisfying reason. And here’s the candle from my seasonal shelfie that I take with me all over the house. That match and stone situation is pretty delightful too, and something else I cannot keep in one place either. Give me all the brambly bramble and old crocks, please. …and wire pumpkins and amber bottles with twigs, too. … and while we at it, throw some wheat in there for good measure. Thank ya, thank ya! Gussy says, “hello” as he sits and watched the leaves fall outside on a fairly uneventful autumn day. All snuggled up watching Hocus Pocus under his favorite blankie. Amok, amok, amok, amok! And lastly, homemade silky Halloween ghosts hanging in our dining room. You cut some white silk into small squares, fill the center with a ball of wool or cotton, tie it with string, draw on a face, and hang! Simple and festive, but not too spooky. Hope you enjoyed our autumn at home tour! Happy weekending! all the little details of life.